The game is played with 15 balls and a cue ball. 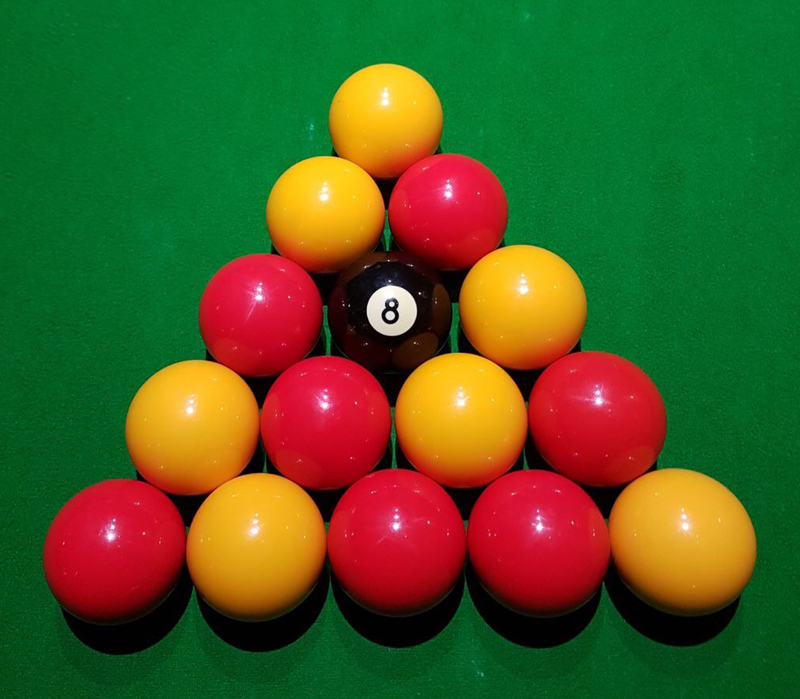 The balls must comprise 7 plain red balls and 7 plain yellow balls plus a black (“8”) ball. 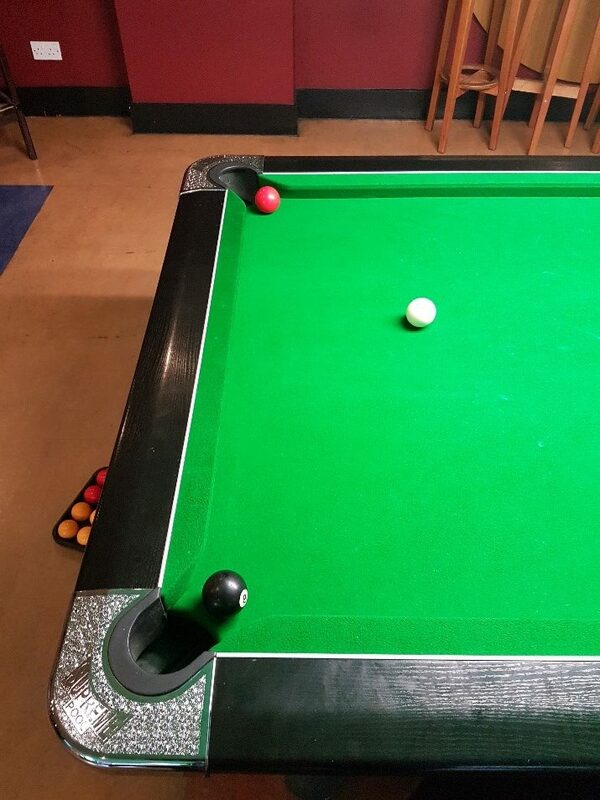 At some venues 7 “spot” balls and 7 “stripe” balls are used in place of red and yellow, this is acceptable. The player(s) pocketing their group first in any order and then legally pocketing the black ball wins the game. 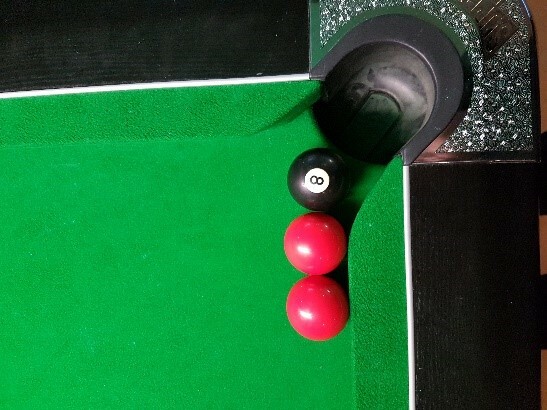 The balls are racked in the same order as shown, with the top ball on the spot. a) The order of play is determined by the toss of a coin. The winner has the option of breaking or requesting his opponent to do so. b) The opening player must play at the triangle of object balls using the cue ball from anywhere on or behind the baulk line. c) The opening player must hit the pack, and at least two racked balls must touch any cushion from the break. If not, this is a foul shot and his opponent is awarded two free shots. The opponent has the option to restart (re-rack) or play on from such a foul shot. ii) The pocket in which the player has to pocket legally the black ball in order to win the game. ii) If, on the break, a player pockets both a red and yellow ball, then the first ball down denotes the player’s group and the player continues the break – i.e. this is not a foul shot. f) If, on the break, a player goes “in-off” with the cue ball as well as potting a ball rule 2d still applies but the player concedes two free shots to his opponent. g) If no ball is pocketed from a legal break, then the player’s alternate shots until a ball or balls are pocketed. If then one ball from each group is pocketed at the same time no foul is committed and play continues with the player been on the group of colours which was pocketed first. ii) The player commits a foul. b) Combination shots are allowed provided the player hits a ball from his/her group first. After any foul the offending player loses his/her turn at the table and the opposing player is entitled to either one or two free shots. ii) If the black ball is played legally onto one of the opponent’s group of balls pocketing that ball only into the nominated pocket of the player on the black, this is a one free shot only foul – i.e. end of break. b) Two Free Shots. The following fouls all award two free shots to the opposing player. 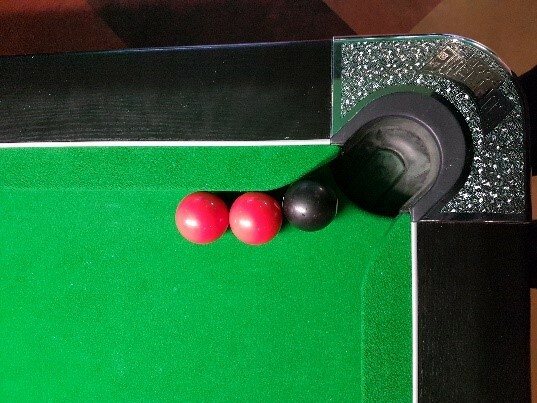 However, if a ball is pocketed with the first free shot then the player loses the second free shot and merely continues the break. a) If not the cue ball, the ball is to be re-spotted on the head spot or as near as possible on a direct line between the head spot and the centre of the back cushion. c) In the event of two or more balls leaving the table they will be replaced in the following manner. If one ball from each player leaves the table then the person who has not committed the foul will have their ball replaced on or as near to the headspot as possible on a direct line between the headspot and the centre of the back cushion, his opponents ball will be replaced as near to the headspot as possible in a direct line with the centre of the back cushion without touching another ball. vii) If a player’s clothing or body touch any ball, whether the ball moves or not. xvii) A trial for this coming winter league season 2017/18 is an introduction of a stop clock for the doubles frames only, this will consist of a 3 minute shot time. The referee will give a warning after 2 minutes has gone with the one minute remaining to take the shot, if the shot isn’t taking in this time then a foul has been committed and two free shots awarded to the opposing players. Note a digital stop watch is to be used only. ii) Request that the cue ball be picked up and then play it from anywhere on or behind the baulk line without loss of the two free shots. b) Foul snooker on the black ball. 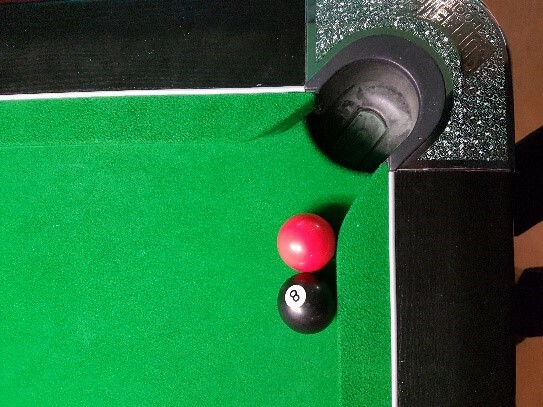 If the black ball is foul snookered by the opponent’s ball, the player may play the nominated ball or combination of balls onto the black ball and pocket it legally into his/her pocket. c) If a player is snookered after a foul stroke leaving the cue ball within the jaws of a pocket, then the cue ball may be picked up and played from anywhere on or behind the baulk line without the loss of the two free shots. 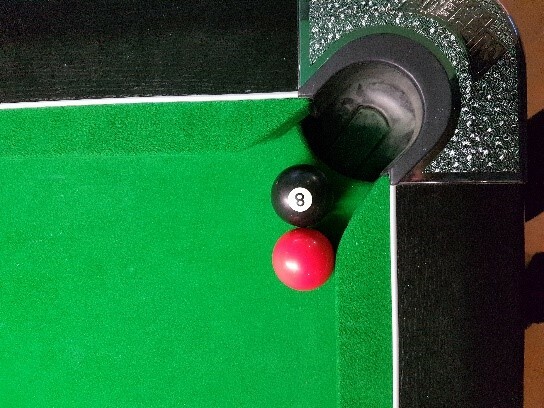 If the player has only one free shot, the cue ball may still be played from anywhere on or behind the baulk line. a) If a player pockets the black ball before pocketing all the balls in the players nominated group, the player loses the game. 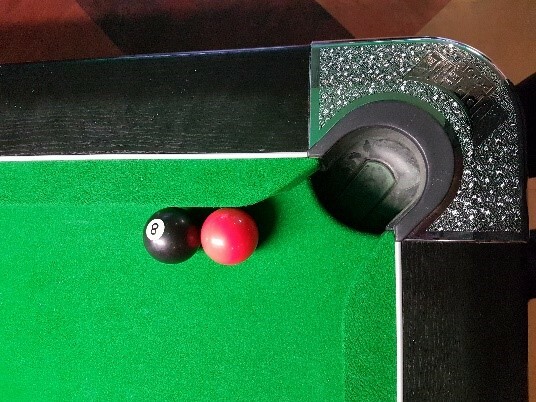 b) If a player pockets the black ball into a pocket other than the player’s nominated pocket, the player loses the game. d) If a player pockets the black ball at any time after the break and commits a foul at the same time then the player loses the game. e) When both players have only the black ball left to pocket any foul shot loses the game, including the black ball leaving the table. a) A push stroke is allowed, but a player may play away from a touching ball of his/her own nominated group and be deemed to have played that ball. Should the cue ball be touching an opponent’s ball or the black ball, the player shall play away without penalty provided that the cue ball strikes one of the players own nominated group. b) Player in Control. A player is deemed to be in control of the game from the time that the player addresses the cue ball prior to his/her shot, through the player’s break and up to the time that the opponent addresses the cue ball prior to his/her shot. Any balls which fall into a pocket during this period are said to have been potted by the player and the player is liable for any penalties or benefits normally awarded to him/her for potting that ball or balls as are accorded him/her in the rules of the game. c) No Legal Shot. 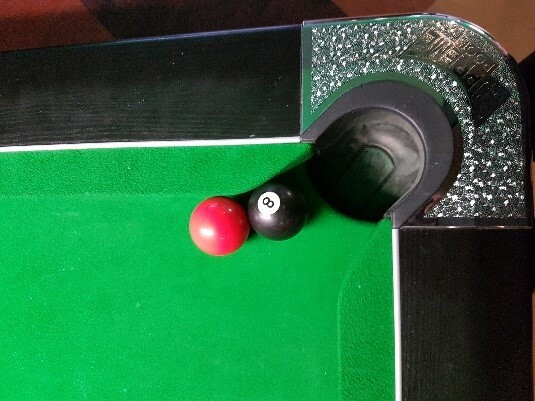 If, in the referee’s opinion, the player in control of the table can play no legal shot, an automatic re-rack should take place with the player who originally broke doing so again. d) Cue Ball in Hand. When a player has the cue ball in hand, the player plays from any position on or behind the baulk line. e) Potting the Black Ball. 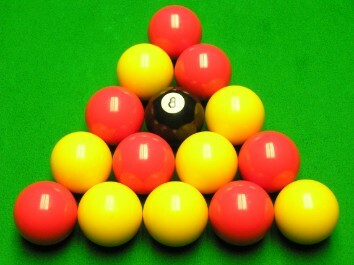 When a player has pocketed all the balls in his/her nominated group, the player may only pot the black ball. Pockets are determined by the first ball down at the start of the game. The opponents pocket is diagonally opposite. 7f I) If the black ball roles into the jaws of a neutral pocket when both players are on the black and it is deemed re spottable by the referee per the diagrams marked 7f ii). Then the black will be re spotted one coloured ball width towards the opponents pocket as per diagram 7f iii). g) Coaching. There must be no coaching by any persons at all except in the pairs match when a player may advise his/her partner before the partner addresses the cue ball at the beginning of the player’s break. Once the player has addressed the cue ball there must be no coaching by any person. i) Unsporting Play. If a Captain thinks a player or team has gained advantage by unsporting play or by misuse of the league rules, then this matter must be reported to the league committee who have the power to change the result of the game or the match at their discretion.